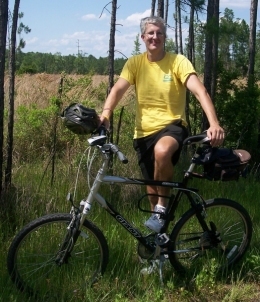 Biking is a fantastic way to have fun, get great exercise, and reduce your carbon footprint. Biking is an adventure -- whether biking to work or the store -- or peddling long-distance for miles and miles. A side benefit is that I find I do some of my best thinking and creative problem-solving while ridiing my bike. Riding a bike is fantastic aerobic exercise, and the longer and more challenging your ride, the better the workout and the better for your health. However, before you even think about biking, get the okay from your doctor. Once you have the medical clearance -- and before you buy or jump on your current bike -- make a plan to gradually start biking. It depends on your final goals, but start with short bike rides around your neighborhood or local bike paths -- generally 2-3 miles at first, gradually adding a few miles at a time. And regardless of the temperature or other weather conditions, ALWAYS pack enough water for your biking adventures -- and carry money with you to purchase more water along the way if you need it. Most of us who ride our bikes do so on roadways with or without bicycle lanes -- though we wish bike lanes were available on ALL roads. If you plan to bike on the road, please review your local traffic laws, as bikes MUST follow the same rules as any other vehicles. Bike safety is a major issue, but as long as you ride your bike cautiously, following all traffic laws, you should be okay. Remember to either ride your bike in the bike lane or as close to the right side of the road as possible. Ride only WITH traffic and do NOT ride on sidewalks unless directed to do so. Finally, as you plan your routes, remember that bicycles are not allowed on interstate highways, toll roads, and other major roadways. Most mapping Websites allow users to choose an option to avoid major highways in route planning. There is always at least one option for avoiding highways. I own two bikes -- a Giant and a Trek. I love them both, but currently ride my Trek more often. You do not need to buy an expensive bicycle, but what you DO need to do is buy a bike that fits you. I was buying cheap bikes at Wal-Mart and Target, which are decent bikes, but much too small for my 6-foot, 3-inch body. Having a bike that fits your body is essential to enjoying biking -- and to avoiding straining yourself. Besides the bicycle, you also should invest in a quality helmet. I've been through a few, but the keys here are fit and comfort. Most states do not require adults to wear helmets, but one could save your life, so spend the additional money and wear it whenever you're on the road. If you're like me and plan to bike to work or for shopping errands, you'll also want to invest in some bike storage. I use a front handlebar pack and a rear deck with bungee cords. I have rented bikes with panniers. I also have a backpack, but using one will make your shirt pretty wet with sweat. If you plan to ride at all times of day, invest in a good set of bike lights -- a strong headlight for seeing the road ahead of you and bright back lights so motorists can see you as they approach. I'm not that big into bike gloves, except in colder climates, but my partner never rides a bike without a pair, so it's up to you. Gloves do provide a little extra comfort when riding -- and can definitely protect your hands in case of a crash. In terms of clothing... when possible, wear comfortable clothing. Some people who bike to work actually wear their dress clothes while biking. I keep a full wardrobe at my office so that I can bike in comfortable clothing and then change to business attire once I arrive. 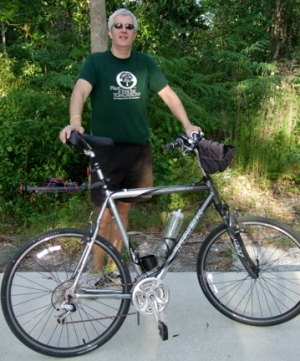 You'll also see some cyclists in full biking gear, but I prefer simply a t-shirt, shorts, and a nice pair of sneakers. Some people carry extra inner tubes and other tire accessories, but I invest in puncture-resistant tires and tubes and sometimes carry a quick-fix aerosol to get me home in case of a flat. I do keep a set of allen wrenches in my pack. Finally, you WILL want to invest in a good bike lock. Ask your bike dealer for the best in your location. I've used U-locks, but currently use a thick-corded cable combination lock that provides me with more flexibility. In some cities, parking garages and facilities may provide secure parking for a small fee. Even when you follow all the rules of the road, you'll need to be alert to road hazards -- crazy drivers, unfriendly animals, poor road conditions. Most drivers you'll encounter are pretty good -- probably just like you and I. Other drivers, however, will honk at you, pass you too closely, turn into you, and run you off the road. You must ALWAYS pay attention to the cars around you and be prepared for evasive action. I will never understand the drivers that honk persistently as they pass. And too many of the bad drivers are the ones talking on their cell phones while driving. Mostly, bikers encounter enthusiastic animals. I've ridden my bikes thousands of miles, and have only encountered about 4 dogs that seemed determined to bite me. I've passed countless more dogs, cats, horses, cows, goats, sheep, and donkeys that seem bemused as I speed past on my bike. Some people do carry animal repellent. Unless you're one of the lucky few who lives in a community that has wisely developed bike lanes, be prepared for biking in less-than-ideal conditions. Since many times we are biking on or near the shoulder, you'll find trash, broken pieces of everything, cracks in the pavement, and other challenges. Read more street biking safety tips in my article, 10 Critical Bike Safety Tips: How to Be Safe on the Road. You can find a lot more information about biking from these other biking organizations and biking links. There are also many -- too many to list here -- local biking organizations and associations that you can find on your own. Adventure Cycling Association. Designed to inspire people to travel by bike for fitness, fun, and self-discovery. Bexcoming a member offers all sorts of benefits, including bike tours, bike routes and maps, and much more. BicycleSafe.com. The name says it all. This site is a fantastic resource for learning how not to get hit by passing cars. Too many cyclists cut through traffic or pull along side cars at intersections rather than behind vehicles. Learn safe biking. Bicycle Universe. Provides links to just about everything related to biking. In fact, calls itself the kitchen sink of bicycles and transportation. Good resources. bicyclinginfo.org. From the Pedestrian and Bicycle Information Center (PBIC), a national clearinghouse for information about health and safety, engineering, advocacy, education, enforcement, access, and mobility for pedestrians (including transit users) and bicyclists. Bicycling Life. An interesting site for "everyday" bicyclists whose mission is to "promote bicycling by demonstrating that legal cycling on streets, roads, and highways is safe, clean, healthy, enjoyable, economical, and beneficial to society, and to provide bike riders with the information and encouragement they need to become vehicular cyclists." Bike to Work Guide. A neat site that provides tips for both employees and employers to encourage biking to work. Learn how you can get your employer on board in promoting biking to work. From Chicagoland Bicycle Federation. Biking to Work Manual. A small, but great collection of tips related to encouraging people to ride bikes to work. Includes sections on clothing, traffic, route planning, safety tips, parking suggestions, and biking resources. From Chicagoland Bicycle Federation. Choosing the Right Bicycle. A guide from About.com that covers the basics for how to find the best bike for your needs. cyclingadvocacy.com. A site that brings together key information and resources on subjects related to cycling advocacy. Lots of great biking links -- a place you could get lost for hours. League of American Bicyclists. A fantastic organization whose mission is to "promote bicycling for fun, fitness and transportation and work through advocacy and education for a bicycle-friendly America." The site includes all sorts of information and resources for bike enthusiasts. Rails-to-Trails Conservancy. A nonprofit organization working with communities to preserve unused rail corridors by transforming them into trails, enhancing the health of America's environment, economy, neighborhoods and people -- whose mission is to "create a nationwide network of trails from former rail lines and connecting corridors to build healthier places for healthier people." Return to Dr. Randall S. Hansen: Personal. Web Guru Dr. Randall S. Hansen, CEO of EmpoweringSites.com, has been empowering people his entire adult life -- to help them better their lives. In fact, empowerment is part of his professional philosophy statement. He is also founder of Quintessential Careers, one of the oldest and most comprehensive career development sites on the Web, as well as founder of MyCollegeSuccessStory.com and EnhanceMyVocabulary.com. He is publisher of Quintessential Careers Press as well as a published author, with several books, chapters in books, and hundreds of articles. He's often quoted in the media and conducts empowering workshops around the country. Hansen is also an educator, having taught at the college level for more than 15 years.